Originally published by Black Rose Anarchist Federation. Written by Tanya H.F. The latest civil unrest has had many university students from across the capital city of Managua protesting against the government’s social security reforms this past week. These students hail from various universities like the Universidad Centroamericana (UCA), Universidad Nacional de Ingenieria (UCI), Universidad Nacional Agraria (UNA), Universidad Autónoma Nacional de Nicaragua – Managua (UNAN), and Universidad Politécnica de Nicaragua (UPOLI). The proposal was to increase social security contribution from both workers and employers and reduce retiree benefits by 5%. Last week, students barricaded the Metropolitan Cathedral in Managua which serves as a refuge for protestors. There, they collected donations and distributed provisions such as water and had student doctors help tend to the wounded. Police eventually surrounded the cathedral and held them hostage until prominent Catholic church official, Monsignor Silvio Jóse Báez who has been critical of Ortega and supportive of protesters, aided and helped assure the release of the students. When the Sandinistas (FSLN) overthrew the Somoza regime in July 1979, they had to work toward reconstructing the social, political and economic structure of the country. They implemented agrarian reforms for redistribution of land, launched vaccination campaigns to open access to healthcare and created literacy campaigns that reduced illiteracy from 80 percent to 12 percent, among other reforms. This was only possible because of the work everyday people put in day after day. Over the last five days, more than 30 people have died, many of them students as well as a journalist. Over 100 are being held prisoners, around 50 remain missing and the overall count of those injured is unknown. 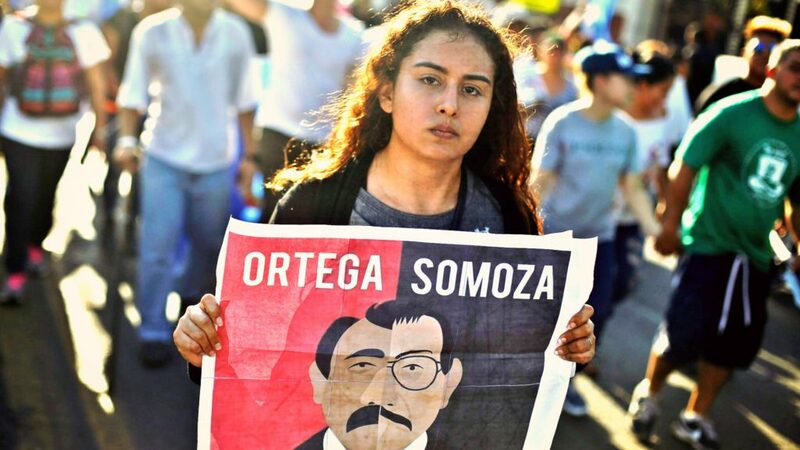 On April 22nd, Nicaraguan President Daniel Ortega, who rose to power as a prominent leader of the Sandinistas, revoked the proposed changes to social security. After he pulled the reforms, riot police entered a prominent symbol of the student resistance, UPOLI, which students had barricaded. Five students were shot in the process and two were killed. Ortega also attacked the student movement as “delinquents” who were backed by right-wing parties and funded by the CIA. The student movement does not allow political parties to participate though. But many Nicaraguans know this is an issue greater than social security. They are tired of corrupt governments and want the current government out. I am an anarchist. So when I say “I am a Sandinista” to me it means I believe in the popular movement that rose up to overthrow capitalist imperialism. The movement that fought for freedom. The movement that dared to dream of bringing a just and equitable society. The current government of Ortega does not represent the values of Sandino nor of the Sandinistas who spilled blood to break free from their chains in previous decades. The Sandinista Youth of today is not the same one that my mother joined many years ago. It is not the one that participated in literacy campaigns to teach the people to read and write, nor is it the one she joined to help pick coffee and rebuild Nicaragua. The immediate resignation of President Daniel Ortega, Vice President and First Lady Rosario Murillo, President of the National Institute of Social Security (INSS) Roberto López Gómez, and First Police Chief Aminta Granero. The release of students, doctors, journalists, and civilians and dropping of all charges. Prosecution of the entire chain of command involved in the death of the civilians with transparency. Suspension of all chief of police officers involved in the murders of civilians. Permanent representation of youth in any national events. Reconstruction of the infrastructure of Universities that were damaged during the repression. Reinstitution of student grades, which were erase of the databases of universities. Nicaragua is in need of material support. Please consider donating to organizers in Nicaragua so that these brave students can continue their work.